The 1TB 840 EVO is the drive we've been waiting for and could cement Samsung at the top of the SSD tech tree. Solid state drives are almost entirely unlike buses. And yet we've been waiting for our 2.5-inch SSDs to hit the 1TB mark for years and now two come along, pretty much at the same time. Okay, Crucial's 960GB M500 managed to nail the 'terabyte-class' moniker before it, but Samsung can at least claim to have the first drive to actually have 1TB on the box. The 840 EVO represents a new range for Samsung's 840 series drives, but despite offering some seriously impressive performance metrics, particularly in the random 4K department, the EVO lineup is not replacing the top 840 Pro series. No, this is where the standard 840 drives bow out, leaving the EVO the consumer-class range below the Pros, with prices to match. 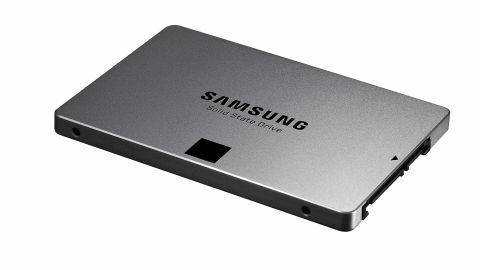 The Pro series then remains the top of the Samsung SSD tech tree, using the more reliable 2-bit MLC NAND Flash, hence the 5 year warranty. The 840 Pro series is also capable of running at its impressive headline speeds all the time, something the new EVO drives cannot manage. But we'll come to the specifics of that later on. The EVO's performance though is still thoroughly impressive for a consumer-class SSD, and with that headline-grabbin' capacity, for a lot of us, could be all the storage drive you need in your PC. Actually, both the Crucial and Samsung 'terabyte-class' drives have more than 1,000GB of NAND Flash storage inside, but, using different forms of memory and wear-levelling/protection methods, neither are actually able to offer a full 1TB of usable storage. The M500 comes out with just over 890GB after formatting and this 840 EVO manages a slightly healthier 930GB. Unlike every other SSD manufacturer out there, Samsung is going it alone. That means pretty much every single component in the 840 EVO is manufactured by Samsung itself. Crucial may be able to boast a huge NAND Flash heritage, but it has to buy in its memory controllers; OCZ picked up Indilinx so it could create its own Barefoot 3 controller, but has no Flash production facilities. From the 19nm 3-bit MLC NAND memory chips to the Samsung MEX memory controller, the 840 EVO is shot through with Samsung like Brighton through a stick of sickly seaside rock. That gives it the ability to price its drives incredibly aggressively; something it's now doing with the EVO range, possibly in response to the price per GB metrics the Crucial M500 has been throwing around recently. This 1TB drive has hit the 51p/GB mark, and the fact that not so long ago we were excited about that getting under the £1(50c)/GB point shows what rapid progress the SSD market is making. As well as the scale of Samsung as a manufacturing machine, it's that 3-bit MLC memory which is helping drive down the cost of this EVO range. The 3-bit MLC (previously referred to as triple-level cell or TLC) enables higher capacity drives without breaking the bank. The 2-bit MLC in the Pro series has more longevity, and some extra performance chops, but Samsung has done some smart work with the EVOs to ensure they're still the quickest SSDs you can pick up today in general usage. The Samsung 840 EVO is the highest-capacity 2.5-inch drive we've ever tested, but is by no means the biggest. The KingSpec 1TB uses a set of mSATA drives arranged in RAID across a PCIe card. The PCIe interface offers dramatically higher sequential performance, but does nothing for the random speeds - and this is arguably what really matters in terms of real-world SSD usage. And given the KingSpec 1TB is still retailing at a far higher price point it puts in perspective just how good the EVO is. The performance of these EVO drives is actually pretty astounding. Inevitably the sequential read and write speeds are held back by the rapidly geriatric-looking SATA 6Gbps interface, at 515MB/s and 503MB/s respectively. This is the same with most modern SSDs, and if you look back at last month's grouptest you'll see every manufacturer's drive bunching up around the same transfer rates. But the random 4K performance is nowhere near saturating the theoretical 600MB/s limit the current SATA interface is shackled by and this is where the 840 EVO scores a home run. The random 4K speed represents how quickly a given drive is capable of shunting around the small, bitty files that make up the bulk of operating system I/O operations. The quicker they're capable of doing this, the smoother the experience of using your rig will be. If your OS drive hits a snag somewhere that's when you get the stuttering and that's when we start to get a bit annoyed with our PCs. The EVO is the current king of random performance, with the new, quicker MEX controller essentially doubling what the previous fastest drives were capable of. We've seen some drives capable of knocking around 55MB/s for random 4K writes, but the 840 EVO manages a class-leading 110MB/s. It's a similar story on random 4K read speeds too, with the quickest drives hitting the mid-twenties and the EVO reporting 41MB/s. The only slight problem here is that one of the previous fastest drives was Samsung's own 840 Pro, which is still down as the top of its SSD range. The reason that placing still works though is because the EVO is using a new write acceleration algorithm, called TurboWrite, to achieve some of its beefier performance scores. The Pro, on the other hand, is capable of these sequential speeds no matter what. The EVO's TurboWrite apportions part of the drive's capacity to act as simulated single-level cell NAND Flash memory. SLC is a good bit quicker than MLC, but doesn't deliver the affordable capacity of the likes of the 3-bit MLC Flash. TurboWrite uses this simulated SLC as a cache, enabling speedy writes to that part of the drive, then when the drive is idle it can quietly flush that data out into the slower storage. For the most part this will mean you get top-end performance much of the time, as it will only slow down when this cache is filled without any idle time to flush it. When the cache is full then it will start writing straight to the MLC as normal. On this 1TB drive that wont be a problem given that it's operating with 12GB of TurboWrite cache. The 120GB and 250GB drives on the other hand have only 3GB, which will get filled up a lot quicker. The serious professional user then, looking to place heavy demands on their solid state storage, is still going to find the Pro range more tailored to their tastes. As a general consumer though you'll likely never feel the difference. The latest version of Samsung's Magician SSD software also has some potentially neat caching software to back up the TurboWrite too. The RAPID mode is designed specifically to help boost random performance and uses spare CPU power and system memory capacity (up to 1GB) to act as another layer of cache. It works in conjunction with Window's own I/O enhancement algorithms, but goes further ensuring 'hot data' - the most frequently used files and applications - is persistently recognised and accelerated. Theoretically your most oft-accessed apps will boot and operate quicker with RAPID mode turned on. It certainly offers some startling performance metrics - AS SSD was showing sequential read/write speeds of 915MB/s and 1,064MB/s respectively, with random 4K writes going up to 284MB/s. Considering the best of the drives in last month's test could only manage 54MB/s at best for their random 4K writes, that should be a game-changer. Unfortunately it's a little harder to see in the real world. Using a relatively long-loading save in Crysis 3 I couldn't get even a slight reduction in load times between having RAPID on or off. Regardless of the EVO's software bundle offering though, the performance of the hardware on its own is enough for us to be rather excited about the new range. As well as the new drive capacities (debuting 750GB and 1TB drives) and the aggressive pricing (the 120GB EVO is only £87) it's that random performance which really puts the icing on this solid state cake. Crucial's 960GB M500 may just have the edge in terms of pricing, offering 'terabyte-class' drives for less than this hefty EVO SSD, but when it comes to performance Samsung has got it in spades. And it's performance where it matters too, not just in headline-grabbing peak speeds. The Samsung 840 EVO is the most responsive SSD we've tested, and with such a large range there's practically a drive here for everyone.